Well, hello there everyone! I can’t believe that today is Wednesday already! During this time of year I always feel like there are so many great pieces that I just have to covet. With that being said and if you are feeling the same way you are in luck because to day I am parting with Francesca’s to share with you some of my December favorites. December is not only my favorite month of the year because it is my birthday but it’s also my favorite because of the clothing. I love adding dashes of sparkle, faux fur and more! Francesca’s always has so many great detailed items that I know I will never be disappointed. When it came to picking out my December favorites I chose pieces that I could be mixed and matched to easily create effortless outfits. The holidays are all about wearing items that make you feel happy and my personal favorite, DAZZLING! This black jumpsuit is stunning! It’s also a great staple to have in your wardrobe. I love that even if this jumpsuit has lace on it you can wear it a ton of different ways! More on that soon! Next up a cozy off white sweater that has the cutest detailing! A statement sweater like this really give a casual outfit a bit of flare! December is all about the outerwear and this coat is a show stopper! Lastly, a little bit of sparkle goes a long way so I chose to get these emerald embellished hair clips. Try using this hair clip as a brooch for a coat! This will give your coat a little extra pop! When it comes to styling this jumpsuit I wanted to give you two ways to layer it that are easy to recreate. The first is by adding this faux fur pink coat over it. 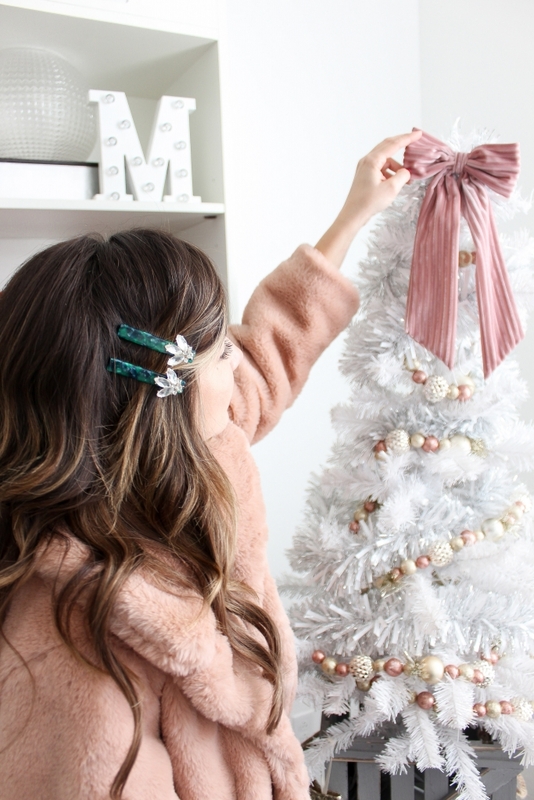 By adding this coat and the hair clips it is the percent amount of holiday glam. Now if you want to give this jumpsuit look a cozy vibe then i’d suggest adding a sweater. I know you might be thinking well how will that work? Easy, take a clear hair band and wrap the bottom of the sweater like a side ponytail. Then tuck that end under and just like that it gives the sweater a bit more shape. I hope you all loved today’s look as much as I do! Now i’m just trying to think which even I want to wear this to next! I love both ways I styled it so i’ll most likely wear it both ways! Make sure you all head on over to Francesca’s to see all the gorgeous items they have! This shimmer romper just popped up on my radar and I must say I quickly added it to my cart! Thanks so much for stopping by to read today’s post! Thank you to Francesca’s for sponsoring today’s post. All thoughts and opinions are my own.